i love how you can draw on tap paper and transfer it to a tee shirt. the image comes out so much crisper than if you drew on the shirt directly. 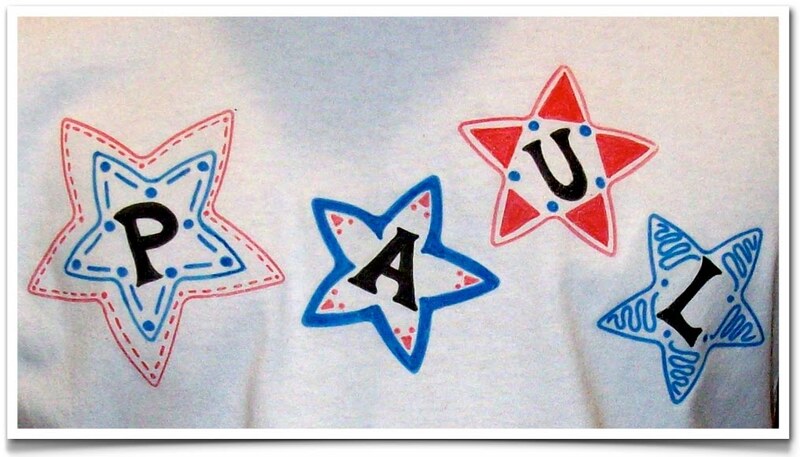 here's an easy way to make a shirt for someone special to wear on the fourth of july. 1. plan your design on a piece of scratch paper first. 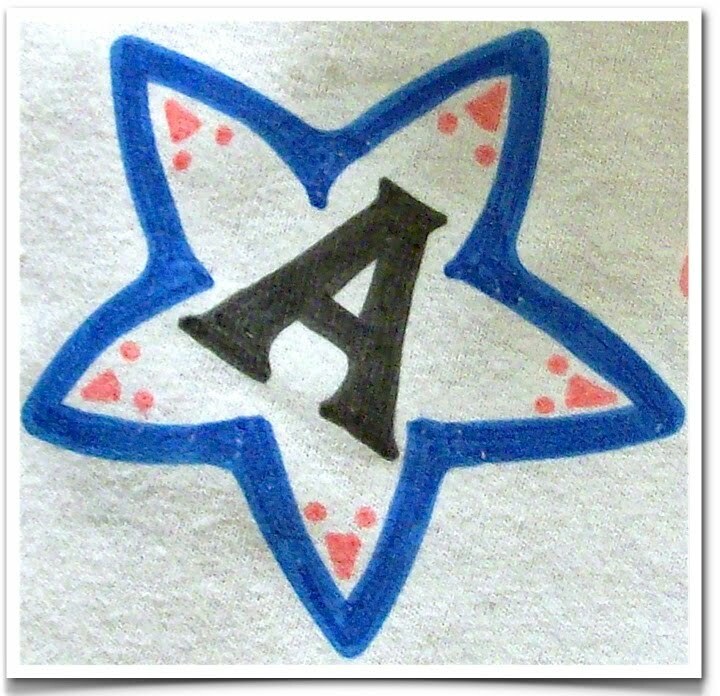 if you want to include letters, you have to draw them backwards for the transfer (tracing regular letters turned backwards on a light box helps make it easier). 2. using permanent opaque markers (choose a brand that doesn't bleed), draw, stencil or trace your design on to the tap. use gentle pressure so you don't damage the surface of the tap. 3. trim out your drawing(s) close to the edges. 4. turn the tap design side toward the tee shirt and position where you want - secure to the tee shirt with a couple small pieces of blue painter's tape. 5. follow the directions on the tap package to transfer the image to your shirt, using a hot iron on a firm, heat-resistant surface (a regular ironing board is not firm enough). I'm making more models for customers...i think this blank board shadow box makes such a nice double-frame for pictures, atc's, etc. i covered the outside with paper strips, adhering with matte gel medium. on the top, i added a torn piece of this super thin black tissuey paper that has metallic specks in it. then i traced the edges of a few different sized jars to create the circular pattern and some edging with a gold leafing pen. 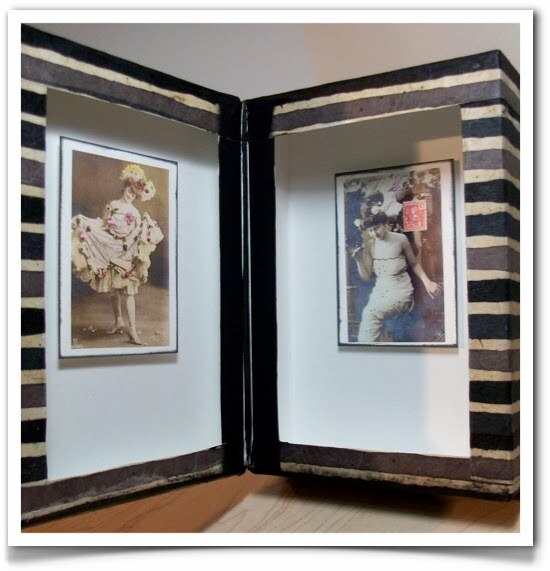 inside are two small vintage image downloads, glued to atc cards, edged with a black stamp pad, and attached with foam pop dots, so they float inside the frame. 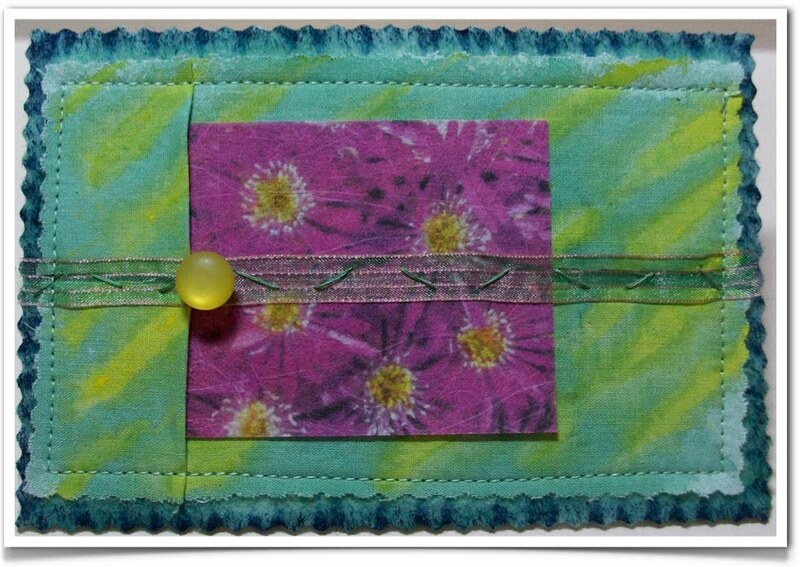 just another little fabric postcard i made - the base is timtex, edged with a green marker. 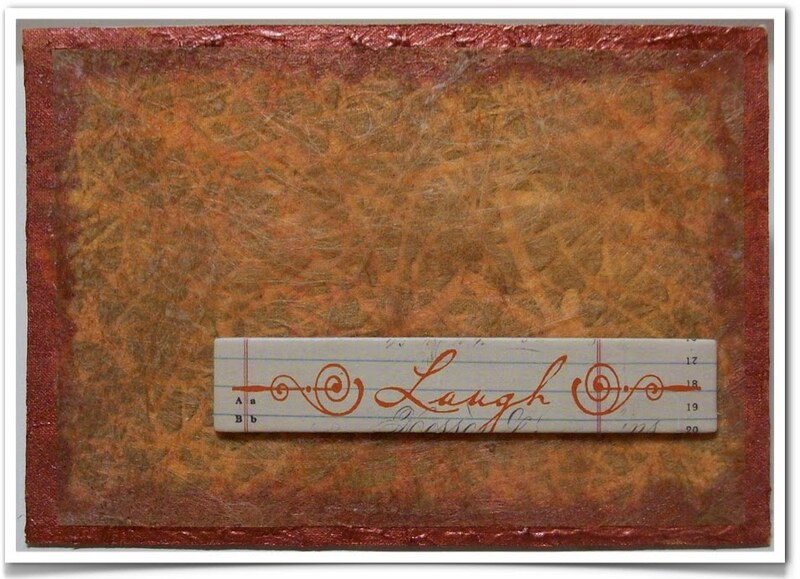 the background is a piece of white cotton streaked with acrylic inks. my pink flower photo was printed on to tap paper, and i colored the flower centers with a yellow marker before transferring the image to a piece of lutradur. i tucked the flower image into a little fold of the fabric, added ribbon and a button, and stitched it all down. one day i'd love to have a whole wall display of postcard art. right now i have some displayed on a postcard rack i bought years ago from an old neighborhood drug store that was going out of business. 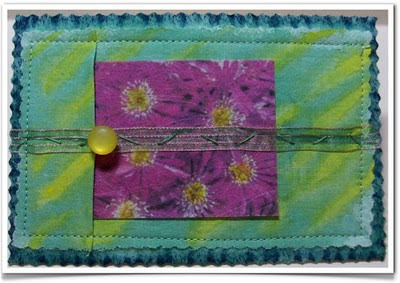 i'm making 4"x6" fabric postcards and greeting cards for use as sales models at work...with tap® transfer artist paper and lutradur. 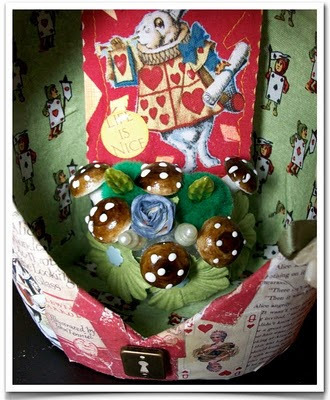 i posted free project instructions in my newsletter (issue 14) for other designs too, if you want to check it out. i started with a webbed background pattern that i printed on to tap with my inkjet printer. i transferred the image to a piece of fabric, then fused the fabric to a piece of fast2fuse. i also fused a piece of white cardstock to the back - fast2fuse has fusible on both sides. then i dabbed some bronze paint with my fingertip around the edges. while that was drying, i spritzed some ultra-light lutradur with a pale tan paint, and trimmed it just a bit smaller than the postcard. i used fabri-tac to adhere the lutradur on top. i added a chippy embelly and done! 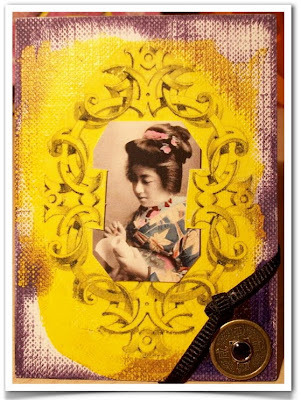 here's how to make this cute little atc of a geisha writing a letter on a scroll. i get most of my clip-art and imagery from the free samples available at dover publications. 1. paint a rough oval of yellow on white linen embossed cardstock, allow to dry. 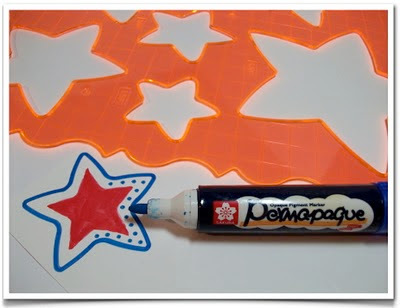 2. print an oval shaped border on to tap paper, trim it out and transfer it with your iron on top of the yellow paint (place a sheet of release paper between your iron and the card to prevent melting any paint onto the surface of your iron). 3. brush roughly around the edges of the card with a purple stamp pad. 4. adhere a small picture of a geisha in the center of the border. 5. tie an overhand knot in a short length of thin black ribbon. wrap it behind the card in one corner and adhere ribbon ends to the back. 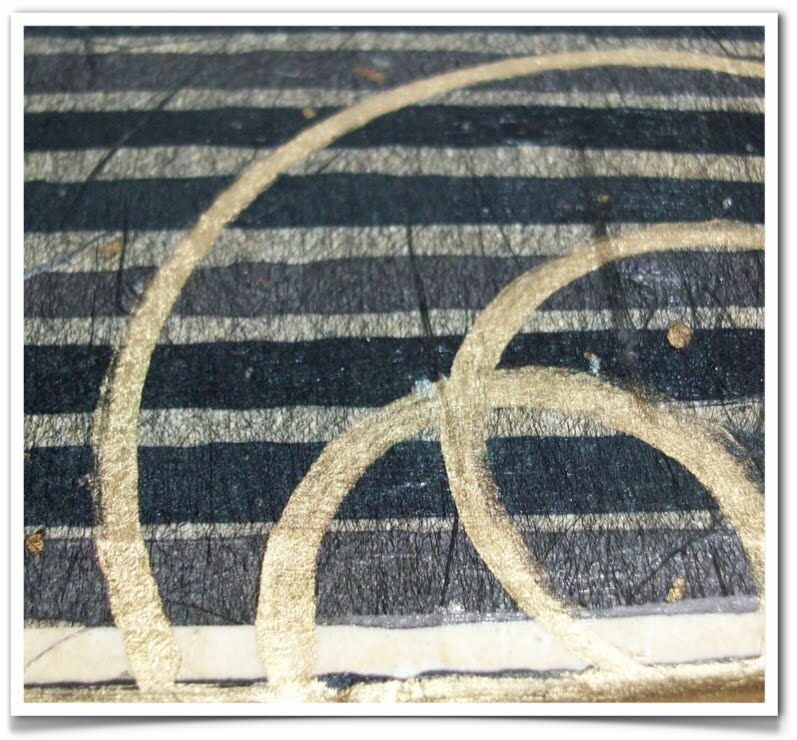 6. punch a small hole beneath the ribbon, insert a small brad through the center hole of a chinese coin embellishment. 7. adhere your completed card to another blank backer card, to hide the ends of the ribbon and brad in between. i finally finished the project i started in a class taught by the ever so talented daniela costa. 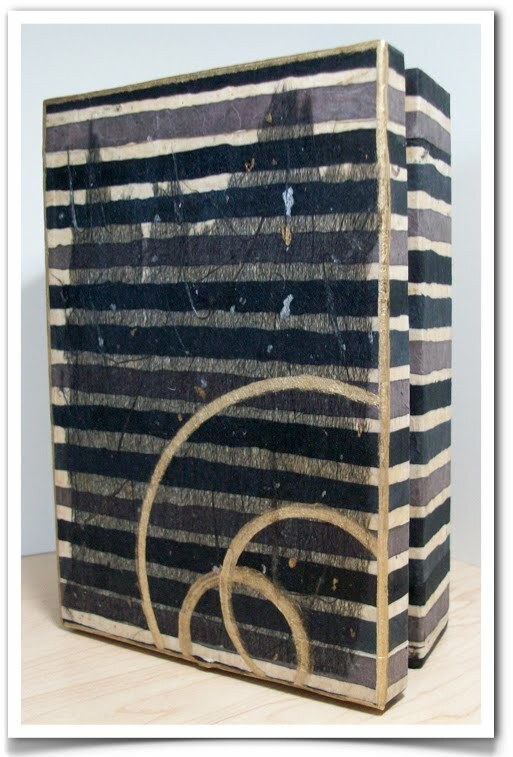 it's a paper-maché bust, collaged with alice in wonderland themed papers, in which i carved out a niche and lined the inside with fabric. i made a slotted base to display an atc in the niche. i embellished her with leaves, flowers, mushrooms and decorative pins. it stands on a pedestal surrounded by a wire mesh skirt, a little more than 20" tall. 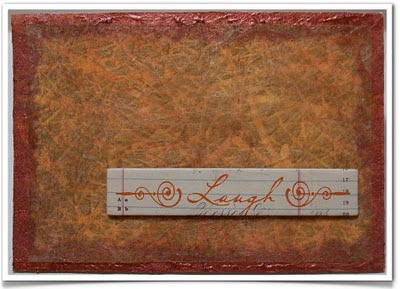 this was a really fun project - i shared it tonight on craft-tastic live, a fun weekly online craft show hosted by the effervescent andrea currie.